The SharePoint Smart Template, allows organisations to easily get started using SharePoint sites as part of Office 365 for an internal intranet, document storage and process management. Your SharePoint Smart Template is built with standard SharePoint functions and no custom code. This means you can and will be encouraged and supported to maintain and manage your own site, avoiding expensive changes. Your site will be branded with your company logo, and colour theme, with permissions setup and documented on which staff members can access which areas. 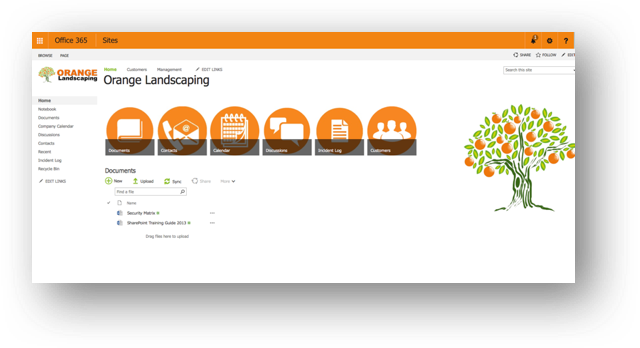 Included with your SharePoint Site is 3 months of Ripped Orange Cloud Trainer Support, including three online training sessions, access to our knowledge base and support when required. Additional training is available for purchase as required.